I cannot tell you guys how much I loved visiting Israel. The experience of walking in the footsteps of Jesus and seeing where He will return turned the Bible into reality for me. I am a very visual person so the entire trip was absolutely incredible and I will be forever grateful for Covenant Journey and their mission there! I mean.. just look at this place! Aside from everything, THE FOOD. 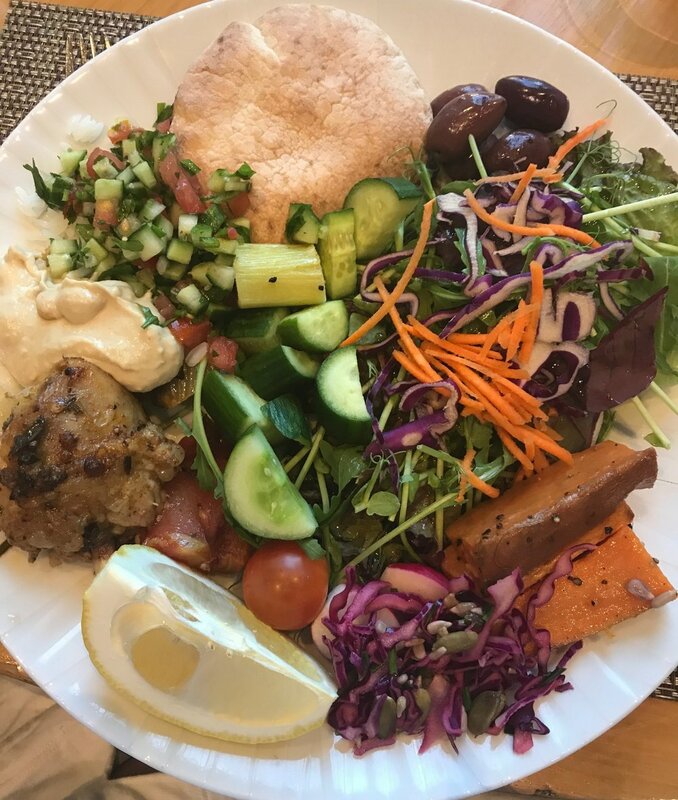 You all know by now that my favorite cuisine is mediterranean / Israeli because everything is so fresh, healthy, and full of all the good fat. 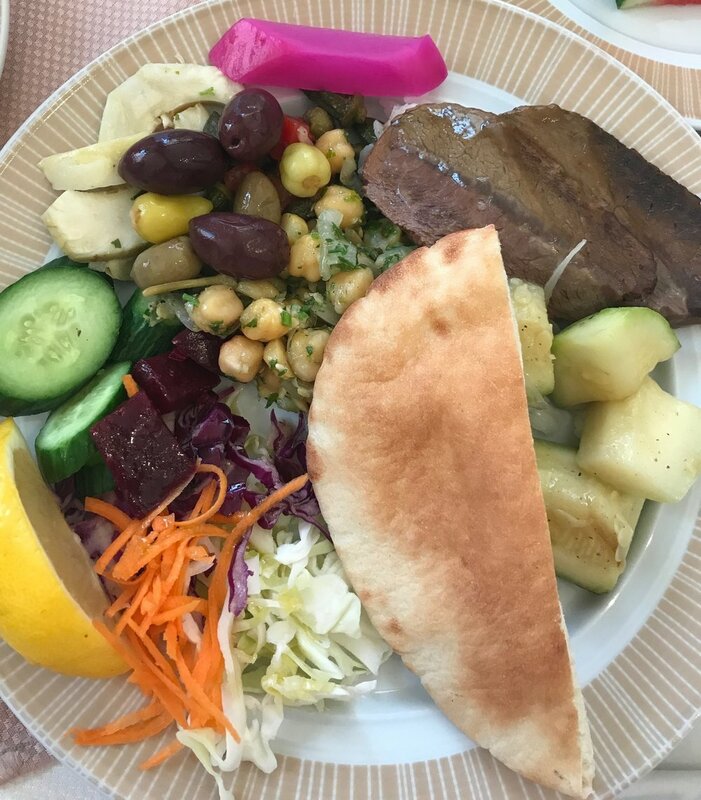 Every meal was fresh and vibrant and I felt amazing throughout the trip! There are flavors I still miss but love trying to recreate here at home! Will and I actually have an Israeli night every so often and we set the table up full of little bowls with fresh tomatoes, cucumbers, hummus, parsley, toasted pine nuts, the works! One of our favorite staples is an Israeli style hummus and lamb (kwarma) balls! I will say, the flavors are different than what we are used to here - but just be open minded and you will quickly fall in love with how perfectly the sweet and spicy seasonings compliment each other!! The night before, soak your chickpeas in a large bowl and cover them with the cold water - at least double their volume. Soak overnight or at least 8 hours. To really begin : drain your chickpeas. Place a medium saucepan over medium high heat and add your drained chickpeas and the baking powder. Stir constantly for about 5 minutes. Add the water and bring to a boil. Cook them and skim off any of the skins and foam that come to the top! I usually set a bowl to the side to keep putting it all in - then you can just toss it! The chickpeas typically take about 25 - 35 minutes to cook depending on the type and freshness so just keep a watch! When they are done, they will be very tender but not mushy. You can use canned chickpeas instead - it will save some time. I have noticed that the chickpeas are more flavorful when using them dried but for a sake of time, it is still really good when using a can! Just drain the can and make sure you have about 3 2/3 cup of them. Drain your chickpeas again and you should have about 3 2/3 cups now. Place your chickpeas in a food processor and process until you have a nice thick and pretty stiff paste. Keep the machine running as you add in your tahini, lemon juice, garlic, and 1.5 tsp of salt (or more if you like). Finally, slowly drizzle in the iced water and allow to mix until you get a creamy smooth texture (about 5 minutes). Serve with your meatballs (below) and some fresh veggies! Place all the ingredients except for the ghee and olive oil in a large bowl and mix well. I like to add everything (but the ghee), stir, then add the ground lamb. It is easier to massage in this way. Set in the fridge for at least 30 minutes. Heat your ghee and olive oil on a large saucepan over medium high heat. Add your lamb in 2-3 at a time in little balls. I like to save time and dishes by just forming them into balls as I go and as they cook. The meat should take about 3-4 minutes to cook but still be slightly pink inside - lamb is more dry than beef. Mix all in a bowl and serve with your meatballs and hummus or all stuffed in a pita pocket! In my recent recipe, I used radishes instead of tomatoes since the season not longer calls for tomatoes and it was perfect!! Pour out your hummus on a plate and serve with a fresh Israeli salad (tomatoes, cucumbers, parsley, salt). Top your hummus with your kawarma. Sprinkle with whatever your heart desires! I love sprinkling toasted pine nuts and pomegranate seeds! And never forget the beloved olives. If you have good pita, just stuff it with all the goods!